No rational individual would claim anything positive or constructive about anti-Semitism in concept and practice. In a strangely perverse and indirect but very real way, though, its existence and pursuit in Europe before the Second World War actually brought a benefit to the United States, in the sense that Europe's exodus of skill, talent and genius was America's gain: artists in all fields who discerningly foresaw the impending calamities wisely relocated from Europe to America (often via other countries), many ultimately settling in California. 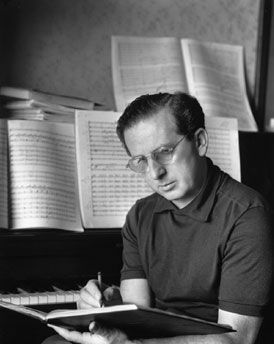 Composer Franz Waxman was one of them. He occupies a very special place in the pantheon of composers in Hollywood. The history of music is filled with composers whose fathers opposed their sons' wishes to make music their lives' work. George Frederick Handel, Hector Berlioz, Frederick Delius (whose lengthy stay in Florida was fundamental to his later work), and Leonard Bernstein are among them, as is Franz Waxman. Berlioz was goaded into medical study by his father; his first experience watching an autopsy was also his last and he fled from the school, never to return. After Bernstein had become a veritable musical icon, his father, Samuel, was asked how he now felt about his former vehement opposition to his son's choice of music as a life. His arresting reply was, "How was I supposed to know he was Leonard Bernstein?" The family name was Wachsmann when Franz was born in Königshütte, Germany (now Chorzow, Poland), in December, 1906. A fine pianist with an early and marked aptitude for composing music, he studied in Dresden and then in Berlin, and played for a time with the Weintraub Syncopaters, one of Europe's most popular jazz ensembles. In 1930 Friedrich Holländer (later, in Hollywood, Frederick Hollander) was composing the music for a film and recommended the studio engage the 24-year-old Waxman. It was he who orchestrated and conducted Holländer's score for Marlene Dietrich's now-classic film, The Blue Angel. In 1934 an incident occurred that had literally far-reaching consequences which altered the course of Franz Waxman's life. He was attacked and severely beaten by Nazi hoodlums on a Berlin street. Fortunately for him and posterity he had the foresight and prudence -- and the wisdom -- to leave Germany with his bride-to-be: abandoning virtually everything, they boarded a train for Paris that very night. Waxman found lodgings at the Hotel Ansonia (no longer extant), some of whose residents were other refugees like Billy Wilder, Fritz Lang, and Peter Lorre. Waxman soon settled in California, where in 1935 his first dramatic score for an American film was for The Bride of Frankenstein, now a classic of its genre. Countless musicians (like Alfred Newman and Victor Young) who scored films came to Hollywood via Broadway, or from a European "theatre" background and environment (e.g., Max Steiner and Ernest Gold, in Vienna). Like his friend and Hungarian colleague in Hollywood, Miklos Rozsa (who could read music before he could read words), Franz Waxman was a product of music conservatories, and both men were composing abstract music long before they ever even thought of entering a film studio. Many composers reach a certain peak of musical maturity and remain at that level. Felix Mendelssohn comes to mind as an example. On the other hand, during his long and profitable career in Hollywood -- his roster of film scores is quite lengthy -- Waxman continued to develop as a composer throughout his musical life, just as Beethoven before him had done. (Apparently there was something of The Absent-Minded Composer about both of them, but more about this, presently). Waxman was the first composer to win the Oscar two years in succession: in 1950 for Sunset Boulevard and in 1951 for A Place In The Sun, both of which are now classics. Among his dozens of other film scores were those for The Silver Chalice (which introduced to the screen a young actor named Paul Newman), The Spirit of St.Louis (commemorating the 30th anniversary of Lindbergh's 1927 solo flight across the Atlantic), The Story of Ruth, The Nun's Story, and Demetrius And The Gladiators (20th-Century-Fox's sequel to its 1953 film, The Robe, the first Cinemascope film ever made). The scores Waxman composed for his biblical-subject films seem to have special musical spirit. Though entirely a product of his own imagination, it's a testament to Franz Waxman's intellect and skill as a composer that the main theme for The Story of Ruth seems to have a more Hebraic flavor than many such authentic melodies. When Oscar-nominated for The Nun's Story score, Waxman's "competition" that year included Ernest Gold for his score for On The Beach and Miklos Rozsa for his music for Ben-Hur. The Oscar went to Rozsa (this author vividly remembers watching the live telecast that night, and will never forget his impression on hearing Rozsa's voice for the very first time). Waxman's reaction was, "Ben-Hur deserved to win," and he added, "Rozsa is the best composer in Hollywood anyway." Thus spoke Franz Waxman after the ceremonies. His remark was genuine and sincere, and the sentiment exemplifies the kind of man he was: devoid of the professional jealousies that pervade the film colony. 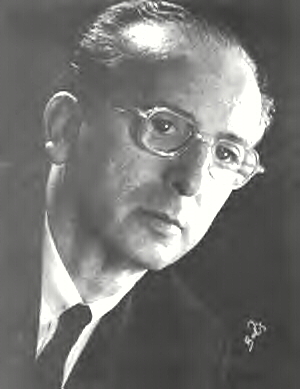 It was Waxman himself who had conducted the orchestra at the West Coast premiere of Rozsa's Violin Concerto in 1956. The following story behind Waxman's score for Demetrius And The Gladiators is emblematic of the composer's character. It's a matter of record that sequels often don't measure up terribly well to the films on which they're based, and those that do are the exceptions to the rule. Demetrius is among them, and is an outstanding example of how a sequel could surpass the original in substance, impact and enjoyment. When Alfred Newman wasn't even nominated for an Academy Award for his own score for The Robe (the film on which Demetrius was based), Franz Waxman did something unprecedented in the annals of the film colony: he resigned from the Academy of Motion Picture Arts & Sciences. He also stipulated that his own screen credit in Demetrius specifically state that his music is based on Alfred Newman's score for The Robe. That's the kind of integrity Franz Waxman had. The Demetrius score is a skillful and fascinating blend of pure Waxman, pure Newman, and Waxman-based-on-Newman. It seems paradoxical that the soundtrack album of The Robe was available on LP for decades, while the music from Waxman's score for Demetrius was never recorded commercially until after the advent of the compact disc. The title music for Demetrius, moving from suspenseful to martial to brooding, has one of the most memorable themes ever to be heard in a film, and the barbaric gladiatorial march Waxman composed for the arena sequence is, in a word, savage in its implication and musical impact. An earnest man and a serious composer, he often devoted more effort to a score than the film's quality really warranted. ". . . Many of the films he scored barely deserved the effort he put into them," wrote the late film historian Tony Thomas in Film Score: The Art & Craft of Movie Music. That Waxman did this bespeaks the seriousness of purpose that distinguishes the exceptional man and musician from the commonplace. Among composers in Hollywood, Franz Waxman was arguably the greatest musical psychologist who ever wrote for films. In the texture and careful placing of music, it was a trait he shared with his colleague at Warner Brothers, Max Steiner (who had studied for a time with Gustav Mahler). For appropriate film sequences, Waxman's music is subtle, not blatant and obvious, and slips easily into viewers' subconscious awareness. Music is one of the most important elements in our enjoyment of a film, and even when, as dictated by the scene, it's actually intended as "background" music we're sometimes aware of its presence. Waxman composed on a level so sophisticated and cunning that he made us subliminally aware of its absence. He was a master of the kind of surprising and very effective harmonic musical progressions that influence the overall impact his films have on us. 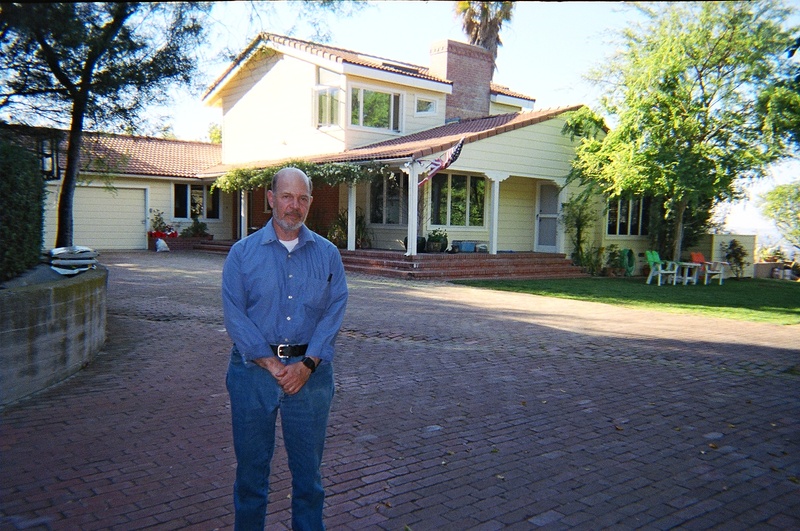 It should surprise no-one who had the good fortune to know Franz Waxman that there's a very real connection between the kind of man he was and the kind of house he built (in 1938) and lived in with his family until the end of his life. Like the man himself, the house and grounds are tasteful and unpretentious, with a subdued but tangible kind of visual quality that can be best described as having Real Class while being unassuming. Situated just off Mulholland Drive in the Hollywood Hills and now with an added second storey, it still has a superb overlook of the San Fernando Valley, all the way to Sylmar and Santa Clarita on the Valley's northern edge. 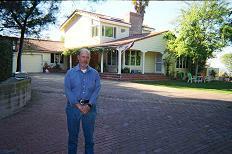 (His home and the Rozsa residence shared the same zip-code, 90046). 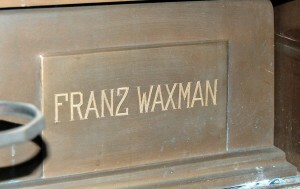 Facing an expansive lawn, Waxman's private studio contained a Steinway piano (with two additional ones enhancing the music room). Much of the study's wall-space was covered by shelves filled with scores and books, above which were his Academy Award nominations. Crowning the contents of his basic repertoire library of music were the Complete Works of Bach -- a component of the studio very revealing of the sincerity and spirit of the man who worked there. (It was the only collection of music Gustav Mahler, too, had in his own composing studio). On one wall was the now-iconic painting by Wilhelm von Beckerath of Johannes Brahms in profile at the piano. The likeness, done in 1896 -- the year before Brahms died -- is almost photographic in its clarity and is, in a word, superb as an image of Brahms and is entirely characteristic of his personal bearing. (His late-in-life photographs will bear this out). The portrait captures the essence of Brahms, playing the piano with his cigar in his mouth, the plume of smoke rising above him. Also in Waxman's study were a large table-desk, and a drafting-table at which he actually composed. His son, John Waxman, still has both of these. The very caliber of the guests who graced Waxman's home at one time or another over the years constitutes yet another link between the surroundings and those visitors themselves. They included French cellist Pierre Fournier (1906-1986), American composer Bernard Herrmann (1911-1975), American pianist William Kapell (1922-1953), Russian cellist Gregor Piatigorsky (1903-1976), Israeli pianist Menahem Pressler (born in 1923), and Russian cellist and conductor Mstislav Rostropovich (1927-2007). John Waxman assures this writer that there are genuine stories behind the visits to the Waxman home of each of these (and countless other) musicians. Another of Waxman's visitors to the Mulholland Terrace home was the man who is debatably the most important symphonist of the 20th century. Like Copland here in America, he was an industry unto himself in his native Russia. The only real musical regret of this author's life is that he never had the opportunity to meet him. His name was Dmitri Shostakovich. As Waxman matured, his musical intellect deepened and his professional activities broadened, and he performed with violinist Isaac Stern, among others. In addition to his film scores, he wrote many works specifically for the concert hall. He, Miklos Rozsa and Erich Wolfgang Korngold (significantly, all conservatory-trained) were the only major composers in Hollywood to do so as a feature of their musical lives. Among such Waxman works are the Fantasy for Violin & Orchestra (the "Carmen Fantasie," for its basis on themes from Bizet's opera), the "Tristan & Isolde" Fantasie (from the Wagner opera), the Sinfonietta for Strings & Tympani, The Charm Bracelet, and the 1959 Joshua, an oratorio (a work for large forces based on a biblical text) which he conducted at the Los Angeles Music Festival. He had founded it in 1947 and was for the remaining two decades of his life its principal conductor. The Rhapsody for Piano & Orchestra was based on themes from his score for the film, The Paradine Case, and his symphonic poem for narrator and orchestra, Ruth, was based on his music for the film, The Story of Ruth. Waxman's 1965 song cycle The Song of Terezin, a large-scale work for mixed chorus, children's chorus, mezzo-soprano soloist and orchestra, may be his most important work for the concert hall. This is significant: the text is based on a collection of poems ("I Never Saw Another Butterfly. . .") written by children interned at Theresienstadt in World War II. Of the 15,000 who were captive at the concentration camp, a mere 100 survived. A word, now, about the directness of expression, and in whatever mode, we usually find in children. Picasso, on visiting a school and being shown art work, is said to have commented, "It took me fifty years to learn to paint like that." He was looking at finger-paintings done by the school's children. The direct simplicity of a child's communication can be arrestingly expressive, surprisingly vivid, beautifully touching, and indeed poetic. Any grandmother will verify this. Conjecture is fruitless but still fascinating: The Song of Terezin might have been performed by Leonard Bernstein during the mid-1980s. John Waxman told this author he had discussed with Bernstein himself the possibility of a New York Philharmonic performance of the work. Bernstein ultimately decided instead to program another song cycle, his own Songfest. His choice is entirely understandable, but was still disappointing to admirers of Franz Waxman's music. Nevertheless, patience can have its own reward: a Decca recording of The Song of Terezin is now available. A composer's musical notehand can actually affect the appearance of his prose letterhand. Even the untrained eye can detect marked influences. Waxman's handwriting offers a classic example. A handwritten letter to the author from the composer reveals no visible difference between his lower-case "b" and the flat sign (which lowers a note by one-half tone) that one can find in his musical manuscripts. This handwriting connection was the very first thing the author noticed when he received that letter. Mozart never heard his last three symphonies, but Waxman heard his Song of Terezin performed, at its premiere in Cincinnati, Ohio. Not long afterward, soon after returning from a year in Europe, the author learned that Franz Waxman had been taken by cancer only two months earlier, on February 24, 1967, two years after completing The Song of Terezin and two months after his 60th birthday. At this point I must forsake an author's anonimity and take a personal role. One day in the fall of 1962 I was walking along 7th Avenue in Manhattan when I passed a man I'd never met but whose face was as familiar to me as his music. I turned around and followed close behind him. What happened next was nothing short of astonishing. -- Most people would open an umbrella to protect them from the rain, and would close it when sheltered. Not this man. Though it was raining lightly, the umbrella he carried was closed. When he passed under the marquee-overhang of the DeMille Theatre, where he'd be sheltered from the rain, he opened his umbrella, continued walking -- and then closed it when he re-entered the rain. The image of The Absent-Minded Composer originated with Beethoven and the tradition was continued by many who followed him -- including the man I was watching, Franz Waxman himself. To get his attention I whistled a theme from Mahler's second symphony ("Resurrection"), which I knew Waxman had recently conducted in Los Angeles. Getting no reaction from him, I tried a theme from one of his own compositions -- presumably a foolproof way of getting a composer's attention -- but even here I got no reaction (though this worked when, years later, I encountered Samuel Barber on the northwest corner of 54th Street and Madison Avenue). I had no choice but to approach Waxman, introduce myself and shake hands with him. I asked him what brought him to New York. "I live here part of the time," he told me. I learned from his son only much later that for the last ten years of his life the composer had had a brownstone on East 65th Street, between Park and Madison Avenues, where he and his wife and son lived on two of the floors. A Baldwin piano graced the apartment, where most of The Song of Terezin had been composed. The talk soon turned to the recent opening of Lincoln Center. "I heard Schumann's Eighth Symphony there," I heard him say. "I thought Robert Schumann composed only four symphonies," I countered knowingly, and as kindly as I could. "William Schuman," replied the maestro even more knowingly and kindly than I. William Schuman, an important American composer, had been president of my alma mater, the Juilliard School, before becoming Lincoln Center's first director. When Waxman stopped and asked me where the United Artists building was, I told him we had passed it two blocks ago. He had a towering musical intellect, but like Beethoven his facility in certain kinds of practical matters seemed woeful, and the masks of Pathos & Comedy were now worn simultaneously. I thought it best to personally accompany him to his destination, which I was glad to do. That meeting, my only one with Franz Waxman, is something for which I am very thankful. The author is sincerely indebted to John Waxman for his kindness and generosity in having furnished specific and very singular details that only he, as the composer’s son, could have provided for this article. 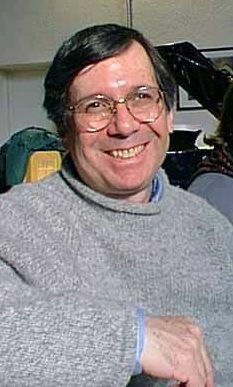 Jeffrey Dane is a music historian, researcher and author whose work appears in the USA and abroad in several languages. His book, A Composer's Notes: Remembering Miklos Rozsa, was published by iUniverse for the 2007 Rozsa centenary. Among the composers in Hollywood he has met, in addition to Franz Waxman, are Elmer Bernstein and Miklos Rozsa (both of whom he knew fairly well), and Jerry Goldsmith and David Raksin.